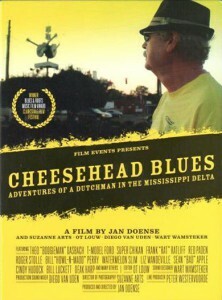 Cheesehead Blues is a film by Jan Doense featuring the music of T-Model Ford, Super Chikan, Bill “Howl-n-Madd” Perry, Liz Mandeville, Sean “Bad” Apple, Deak Harp and others/ This highly entertaining documentary centers on the life of Theo “Boogieman” Dasbach, a native of the Netherlands who’s been running the Rock-‘n’-Blues Museum out of a storefront in Clarksdale, Miss., for the past six years. 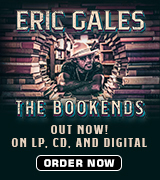 But it also serves as an in-depth study into the minds of residents – both locally born and emigres – who are working at a grassroots level to keep the blues alive at the place of its birth. 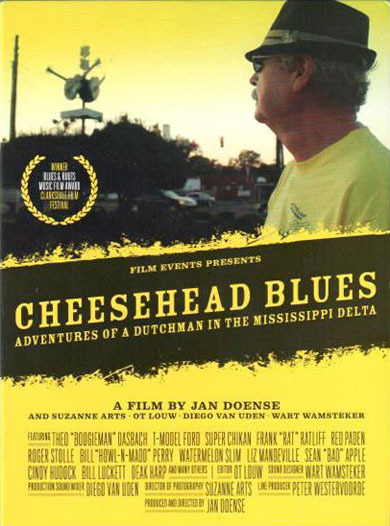 Jan Doense, a blues lover and the director of this project, first met Dasbach in 2011 during a trip to Clarksdale, which is both the birthplace of W.C. Handy and the city where Bessie Smith met her untimely end. He was captivated by the extensive collection of blues and early rock memorabilia displayed by his countryman, a fellow “Kaaskop” or “Cheesehead” in Dutch nomenclature. A barrelhouse keyboard player, Dasbach worked as a banker on both sides of the Atlantic before opening the museum first out of a former butcher shop in Arum, Netherlands, in 1996. He and his American-born wife planned to move it to Memphis, but decided on Clarksdale after realizing they were facing high real estate costs and competition from several other museums. The decision proved fortuitous because the blues revival in Clarksdale was just taking root. 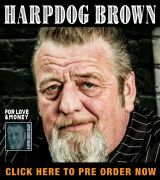 Dasbach’s story is intertwined here with insightful interviews with several of the musicians who make the Delta town, which is situated about an hour south of Beale Street, as well as Mayor Bill Luckett; the late Frank “Rat” Ratliff, owner of the historic Riverside Hotel, home to many blues superstars in the ‘30s and ‘40s and where Smith died; Red Paden, owner of Red’s juke joint, which boasts of being “backed by the river, fronted by the grave”; and Bill Luckett, co-owner with actor Morgan Freeman of the famed Ground Zero blues club. Also featured prominently are several other folks who’ve relocated to Clarksdale and opened blues-related establishments, including Ohioan Roger Stolle, owner of the Cat Head Delta Blues And Folk Art Store; and Stan Street, a harmonica player and folk artist formerly based in Florida, owner of Hambone Art Gallery; as well as Guy Malvezzi, an area native who’s co-owner of the popular Shack Up Inn and Juke Joint Chapel complex, where Charlie Musselwhite recorded a stunning CD a couple of years ago. If you’ve never been to Clarksdale, this video, which is far, far more than a travelog, will give you an in-your-face view of all of the sites mentioned above with snippets of performances by a diverse group of artists, ranging from Clarksdale transplant musicians Watermelon Slim and Deak Harp, who’s featured in a one-man band performance in front of his harmonica emporium at the start of the show, to Minnesota-based Davina And The Vagabonds and Chicagoan Liz Mandeville, as well as locals Super Chikan, Sean “Bad” Apple, Bill “Howl-n-Madd” Perry and his family band, Selwyn Cooper, Rosalind Wilcox, Charlie Moore and others. Fifty minutes of bonus footage include a six-minute trailer plus not-to-miss live performances from Terry “Harmonica” Bean, Super Chikan keyboard player LaLa Craig, Perry, Ford, Mandeville and Donna Herula, and David Raye and David Summers. While Clarksdale still looks much like it did 100 years ago – for the most part ramshackle and dirt-poor, which this film clearly shows – the spirit is strong. Cheesehead Blues displays the music and people who make and support it as they truly exist, warts and all. If you’re looking for a slick performance video, look elsewhere. But if you’re looking for a look at the blues as it exists at ground zero, definitely add this to your collection. You won’t be disappointed.